This is only the second CD by the Danish pianist Emil Gryesten (b.1985), following his recording debut with Schubert’s late C minor Sonata. He now offers us his Liszt, like so many young pianists of recent years. Once the preserve on disc of a few master virtuosi, it is as if the world’s conservatoires now resound daily with this challenging music. Can another young artist really have something to say about these pieces, that Arrau, Brendel, Curzon, Horowitz, Hough, Kempff, Pletnev, Pollini, Richter and Zimmerman have not already told us? And that’s just an off-the-top-of-the-head A-Z of great recordings of the B minor Sonata, the main work here. But each generation must make an attempt on these summits, and the young Dane is the latest mountaineer to don his crampons and seek to measure up to one of the peaks of the entire 19th century piano repertory. The Sonata opens pensively enough with a fairly straight, but atmospheric and expectant, exposition of the small motifs that will yield so much. The first subject and ensuing passagework are less compelling in terms of virtuosity than most, and not always ideally clear, but the tempo and phrasing are right, with none of the excitable surging forward that can derail a performance early on. The Grandioso second subject is just that, and flows naturally into the cantando espressivo section. All this is in scale and kept moving, so that the ‘slow movement’ sounds like a new section (which it is) rather than just another episode, its andante sostenuto evocative but never lingering. The fugato is done with clarity and impetus – qualities not easily combined at this point, and the returning material sounds transformed, as it should. The challenge of the headlong octaves in the coda is met well enough, and the wonderful quiet ending is as moving as it should be. Liszt’s great biographer Alan Walker wrote of performances of the B minor Sonata in which “the notes are all there but the piece is missing”. Others might impress more with their playing in this or that passage, but we do experience the piece itself in Gryesten’s intelligent account, and that is what matters. The rest of the CD programme is all major Liszt – no obscure and undemanding foothills here, only more pinnacles, including three of the nine numbers from the Swiss book of the Années de pelèrinage (Years of Pilgrimage). The ‘Chapelle de Guillaume Tell’ begins nobly and rises to an impassioned climax, very well graduated by Gryesten, who can make a big sound without becoming hard and clangorous. The great centrepiece of the Swiss book, the ‘Vallée d’Obermann’ is filled with awe at the grandeur of nature, and the fine playing holds the attention throughout its near 14 minutes, more inward than picturesque, but rising to its drama also. ‘Les cloches de Genève’ (The Bells of Geneva) is one of Liszt’s impressionistic bell pieces, a nocturne whose opening and closing quiet music is poetically poised in this exquisite account. Isolde’s Liebestod, from Wagner’s Tristan und Isolde is one of Liszt’s most often played transcriptions. It is liberated, of course, from the need to consider a singer, so that here tempi can be stretched out teasingly as we approach the great climax, in a way that would have a soprano hurrying ahead. It makes an impact, but never feels truly like a “transfiguration” (Wagner’s actual term, not ‘love-death’), so is perhaps the least effective piece on the CD. The third of the Paganini Etudes ‘La Campanella’ is another bell piece, and a set of variations on the theme from Paganini’s Second Violin Concerto. It is of course very challenging technically, and while Gryesten demonstrates all the virtuosity it requires, he also keeps its purely musical charms to the fore. This is clearly a very recommendable Liszt selection, with six essential pieces, contrasted in scale and character, expertly performed. The pianist writes his own eloquent booklet notes, (although the statement that “the pianistic style of Liszt’s compositions is actually not particularly innovative” might raise a few eyebrows). The piano sound is more than adequate if not quite top quality, warm and full in the bass, sometimes dry and brittle at the top, but not so much as to rob the tintinnabulations of La Campanella of their effect. 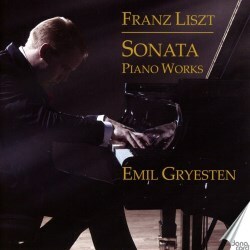 Gryesten is a dedicated Lisztian, who treats these works as the noble inspirations that they are, not just vehicles for the display of technique. It joins many another excellent CDs, of course, on the Liszt recital shelf, but may well prove to be one that gets taken down and played from time to time.